I wrote this post almost exactly a year back. But along the way I forgot my commitment to the Morning Pages and to the invitation I had given you, dear readers to Write Your Heart Out With the Artist’ Way. I’m happy to report I’ve restarted my Morning Pages practice and invite you to journey along with me once again, this year. I’m not changing anything about the post. I’m even extending the linky, in case you want to add a post. and I thought I’d invite you along on my journey. For the next 14 weeks, I’ll be sharing thoughts, ideas and experiences from the book and my personal experience, every Thursday. It would we wonderful if you got your own copy of the book and we journeyed together. What is The Artist’s Way? The Artist’s Way is a course that guides you through the process of rediscovering your creative self. It dispels the ‘I’m not talented enough’ conditioning that holds many people back and helps you to unleash your own inner artist. I have found that using the tools of The Artist’s Way has helped me not only to become more creative but to become more sure of who I am. This week, we’ll be looking at the basic principles, the basic tools and the creativity contract that are an integral part of the artist’s way. 1. Creativity is the natural order of life. Life is energy; pure creative energy. 2. There is an underlying, in-dwelling creative force infusing all of life – including ourselves. 8. As we open our creative channel to the creator, many gentle, but powerful changes are to be expected. Morning pages are three pages of writing (long hand) anything that comes to your head. Julia Cameron suggests that you make Morning Pages a practice that you keep every day while you are working through The Artist’s Way, and hopefully, beyond. The Artist Date is a commitment to spend time with yourself once a week. It is a date with your inner artist, or your inner-child. I have found that both these tools helped me to go deeper into myself and to acknowledge parts of myself and my life experiences that I had buried deep. Despite how hard this can be at times, it is totally worth the effort. At the start of the course, you are encouraged to make a contract with yourself. I’m making my Creativity Contract public today. You can download a blank contract here and fill it up for yourself. I, Corinne , understand that I am undertaking an intensive, guided encounter with my own creativity. I commit myself to the twelve-week duration of the course. I, Corinne, commit to weekly reading, daily morning pages, a weekly artist date, and the fulfillment of each week’s tasks. I, Corinne, further understand that this course will raise issues and emotions for me to deal with. I, Corinne, commit myself to excellent self-care–adequate sleep, diet, exercise and pampering–for the duration of the course. Next Thursday, I’ll be talking about Week 1 of the course – Recovering A Sense of Safety. Would you like to join me on this journey? Let me know in the comments or via the contact form. 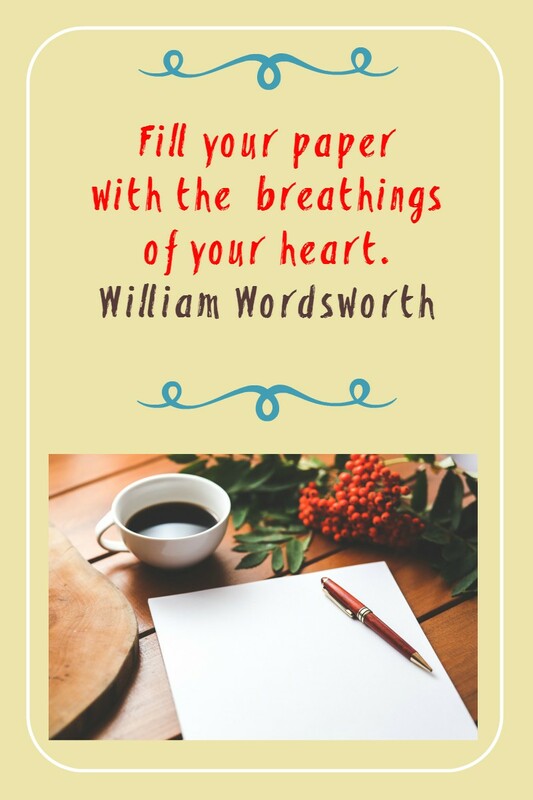 Write Your Heart Out #wyho is weekly feature that appears every Thursday here with a linky that will be open from Thursday to Sunday. What according to you would be good reasons to break off a relationship? 7 signs that it’s time for you to find a new job. Let this picture inspire you to write a story or a poem. I will definitely try these morning pages to unburden my mind. I need it.Thanks for introducing us to this wonderful exercise. I passed last year, but this year I am more determined to take control over certain aspects of my life. I will be happy to join at least the Thursday linky and will definitely read your posts. I must grow and honor my creativity. This is interesting…..Haven’t read the book….The picture prompt is missing Corinne…. Oh! Your passion towards writing is magnetizing me. I am so much yearning to join this Corinne, I don’t have a creative category in my site. May be I would eventually begin one of those too. I love this book so much. I discovered it in a shop where they sell remainders really cheaply, about 10 years ago. i went back and bought all they had, to give away to friends because I loved it so much. It really helped me develop my artistic side more than my writing. I had always written but needed to unlock other aspects of my creativity and this book REALLY helped that happen. I loved the concept of the artists date and did that a lot. I now free-wheel with my art and craft and get so much peace and enjoyment from being alone creating. I owe this book and Julia Cameron so much. The morning pages really helped me sort my head out. The artists way is indeed a great one. though I may find the long hand part a bit tough….. But I am going to give it a short… Thanks for sharing the printable copy. Oh my goodness. I have had The Artist’s Way for over 30 years and have yet to complete it! You have inspired me to pick it up again! I just found you via #blogsharelearn and am glad I did! Corinne thanks for this wonderful tip. You are indeed a true guide for lost souls like me who sometimes struggle to let the inner child out. I will definitely look up the Artists Way and at least ponder about taking the first step. May your creative juices keep on flowing. I am determined this year not to take on more than I can reasonably commit to – but I have shared this on Facebook and Twitter. Good luck, Corinne! Good luck with doing the book again Corinne. I loved the idea of Artist’s way. Creativity is always there we just fail to recognize it and appreciate it. I liked the ideas of morning pages and the Artist Date.